(Phys.org) -- A maneuver on Tuesday adjusted the flight path of NASA's Mars Science Laboratory spacecraft for delivering the rover Curiosity to a landing target beside a Martian mountain. The car-size, one-ton rover is bound for arrival the evening of Aug. 5, 2012, PDT (early Aug. 6, EDT and Universal Time). The landing will mark the beginning of a two-year prime mission to investigate whether one of the most intriguing places on Mars ever offered an environment favorable for microbial life. The latest trajectory correction maneuver, the third and smallest since the Nov. 26, 2011, launch, used four thruster firings totaling just 40 seconds. Spacecraft data and Doppler-effect changes in radio signal from the craft indicate the maneuver succeeded. As designed by engineers at NASA's Jet Propulsion Laboratory, Pasadena, Calif., the maneuver adjusts the location where the spacecraft will enter Mars' atmosphere by about 125 miles (200 kilometers) and advances the time of entry by about 70 seconds. "This puts us closer to our entry target, so if any further maneuvers are needed, I expect them to be small," said JPL's Tomas Martin-Mur, the mission's navigation team chief. Opportunities for up to three additional trajectory correction maneuvers are scheduled during the final eight days of the flight. The maneuver served both to correct errors in the flight path that remained after earlier correction maneuvers and to carry out a decision this month to shift the landing target about 4 miles (7 kilometers) closer to the mountain. It altered the spacecraft's velocity by about one-tenth of a mile per hour (50 millimeters per second). The flight's first and second trajectory correction maneuvers produced velocity changes about 150 times larger on Jan. 11 and about 20 times larger on March 26. Shifting the landing target closer to the mountain, informally named Mount Sharp, may shave months off the time needed for driving from the touchdown location to selected destinations at exposures of water-related minerals on the slope of the mountain. The flight to Mars has entered its "approach phase" leading to landing day. Mission Manager Arthur Amador of JPL said, "In the next 40 days, the flight team will be laser-focused on the preparations for the challenging events of landing day -- continuously tracking the spacecraft's trajectory and monitoring the health and performance of its onboard systems, while using NASA's Deep Space Network to stay in continuous communications. We're in the home stretch now. The spacecraft continues to perform very well. And the flight team is up for the challenge." Descent from the top of Mars' atmosphere to the surface will employ bold techniques enabling use of a smaller target area and heavier landed payload than were possible for any previous Mars mission. These innovations, if successful, will place a well-equipped mobile laboratory into a locale especially well suited for its mission of discovery. The same innovations advance NASA toward capabilities needed for human missions to Mars. 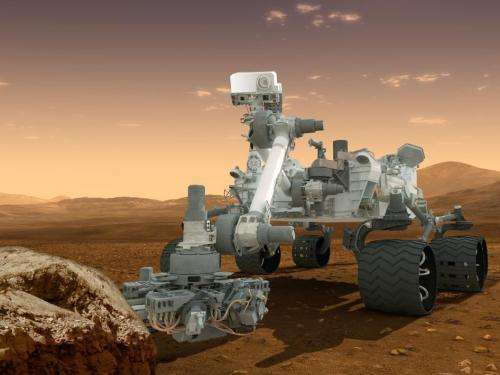 As of June 27, the Mars Science Laboratory spacecraft carrying the rover Curiosity will have traveled about 307 million miles (494 million kilometers) of its 352-million-mile (567-million-kilometer) flight to Mars. You all know that August is my month. August is the month of emperador Augustus. By my greatness you are all invited to celebrate the probe to Mars. I've got a bad feeling that the contractor was under too much pressure to deliver this buggy, so it's just easier to crater it into Mars. There was a LOT of behind the scenes drama related to this thing. More yelling, screaming and crying than you would believe at NASA. People quit and were fired, it goes on and on. I'm afraid that they looked at the 50% success rate of Mars missions and figured no one would look too hard if it landed at 2,000mph somewhere near Gale Crater. They could just shrug and say "This stuff is hard." I'll be very happy to be wrong. Why cant humans be positive and collaborate better, it really is easier and more sensible to be smart - ffs !